Along with propagating inane hashtags like #NameYourDickAfterAMovie*, Twitter is also horribly ruthless when it comes to spoiling movies and TV shows. To prevent an unwelcome spoiler, you have to basically abstain from Twitter when a show like Breaking Bad comes on or when a big movie like The Dark Knight Rises comes out. But that's not the only way! 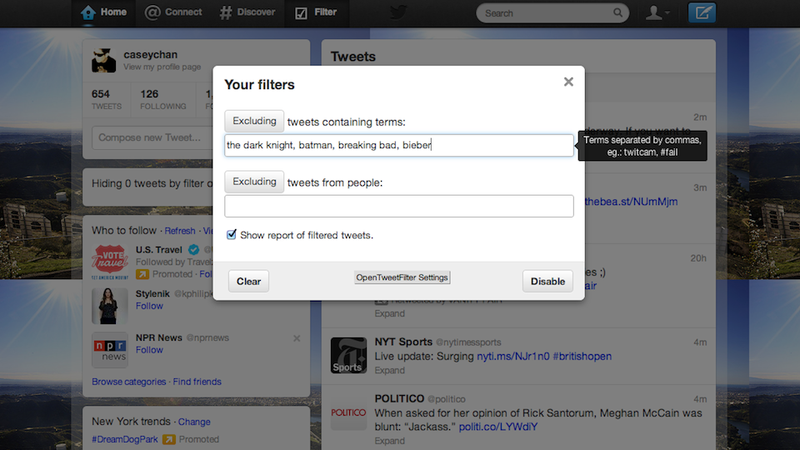 Here's how to make your Twitter spoiler-free. BuzzFeed FWD came up with a good guide on how to filter out specific words and phrases from your timeline and here's the breakdown for each platform. The official Twitter for Desktop doesn't have any filter options so you'll have to use Tweetdeck if you want to use Twitter on your computer to avoid spoilers. Tweetdeck allows you to set up Global filters which work the same way as the Chrome plug-in, simply hit Preferences > Global Filters and add the things you don't want to see. The official Twitter app for iPhone or Android doesn't support filters either so you'll have to jump to third party apps like Tweetbot for iOS or Plume and Twicca for Android are good places to start.